↑ Blackbourn, David, (2006). The Conquest of Nature: Water, Landscape and the Making of Modern Germany. Jonathan Cape. ↑ Karakov, G. (George), 1952 plan for the draining of the Pripet Marshes. New York, N.Y. : Research Program on the U.S.S.R., 1953 (OCoLC)623960881. Налибокская пуща — сплошной массив в бассейнах Западной Березины и Усы. Принадлежит к Неманско-Передполесскому геоботаническому округу подзоны грабово-дубово-темнохвойных лесов. Налибокская пуща занимает восточную часть озёрно-ледниковой и аллювиальной Верхнянеманской низменности. Рельеф волнистый. Структура ландшафта, в основном, равнинная с дюно- и моренно-холмистыми формами и заболоченными понижениями. На юге массива находится озеро Кромань. Леса имеют характер переходной полосы от южнотаежных темнохвойных к западноевропейким широколистным. Преобладают боры. Сосняки перемешиваются с ельниками, березняками и осинниками. Дубрав мало. По южно-западной части Налибокской пуще проходит северная граница сплошного распространения граба, встречается он здесь в основным в подлесках. Почвы преимущественно дерново-подзолистые песчаные и супесчаные. Наиболее заболоченная территория по долинах рек Березина, Ислочь, Волка и в нижнем течении Усы, где на торфяно-болотных почвах растут ольховники и березняки. Среди еловых лесов много черничных и кисличных. Центральная и восточная часть пущи меньше заболоченная, здесь распространены сосняки разных типов — от вересково-имшыстых к верховым сфагновым. Распространённые производные бородавчатоберезового леса. Встречаются ясеневые леса. Среди редких растений: арника горная, лунник оживающий, лилия кудреватая и др. The word ćevap comes from Turkish kebab, sometimes with the South Slavic diminutive ending -čići (Albanian: Qebapa/Qofte; Croatian: ćevapčići/ćevapi; Slovene: čevapčiči/čevapi; Bosnian, սերբ.՝ ћевапи/ћевапчићи ćevapi/ćevapčići; մակեդ.՝ ќебапчиња, kjebapčinja; բուլղար․՝ Кебапчета, kebapcheta, չեխ․՝ čevabčiči, սլովակ.՝ čevapčiči). The word ćevapi is plural; the singular form ćevap is rarely used, as a typical serving consists of several ćevapi. Ćevapi in somun, with onion, from Sarajevo. During the Ottoman administration, hajduks (rebels, outlaws) made the hajdučki ćevap ("hajduk cevap"), which was easy to make, out of pieces of meat and smoked lard on a skewer roasted over fire. The recipe of the Leskovački ćevap ("Leskovac ćevap"), a local specialty of Serbia, was based on traditional Pljeskavica (meat patty), formed as sausage (ćevap). Leskovac has a long history of grill shops. In Belgrade, ćevapčići first came from Leskovac in the 1860s, into the kafana "Rajić" at the Great Marketplace (today Studentski Trg), from where they quickly spread across the city, and subsequently, country. The industry quickly multiplied, as ćevapčići was the drinking public's favourite. The ćevapčići were served at shops, known as ćevabdžija (Կաղապար:Plural abbr ćevabdžije). A 1927–28 study in Belgrade told that people either ate in the restaurant or outside ("on the kaldrma"), often take-away. The shops served from early morning to 10 AM, while often the dish was bought for breakfast. Before the 1930s, they spread to the rest of Yugoslavia, including east of Serbia and the Macedonia region. By 1932, ćevapčići were regarded a local specialty in southern Serbia, Skopje and Peć. In 1933, the first street food vendor appeared in Maribor, Slovenia, who came from Leskovac, and served grilled meat, including ćevapčići. In 1940, ten pieces cost one Yugoslav dinar. In the second half of the 20th century, ćevapčići and other Oriental dishes entered Croatian cuisine. The Leskovac-styled grilled meat, including ćevapčići, have today become part of everyday-diet in Slovenia. Today, ćevapčići are found outside former Yugoslavia in the diaspora communities. Today, the grill shops are known as ćevabdžinica (pl. ćevabdžinice). Leskovac organizes an annual grill festival, the Leskovac Grill Festival, as a showcase of ćevapi and other grilled meat. A type of mixed-meat Serbian Ćevapčići. Կաղապար:Unreferenced section They are usually served of 5-10 pieces on a plate or in a flatbread (lepinje or somun), often with chopped onions, sour cream, kajmak, ajvar, cottage cheese, minced red pepper and salt. Bosnian-type ćevapi (halal) are made from two types of minced beef meat, hand mixed and formed with a funnel, while formed ćevapi are grilled. Serbian-type ćevapi (ćevapčići) are made of either beef, lamb or pork, or mixed. In Austria, Czech Republic and Slovakia, čevapčiči is generally served with mustard mixed with finely chopped raw onions and potatoes or French fries, in a common fast food manner. Ćevapčići are shown on the right in this example of Serbian cuisine. There are variations in meat content and seasoning. The dish is kept simple, and traditionally served in somun with onions and/or kajmak and yogurt as appetizer. Buranija - green beans soup. Can be cooked with meat and sometimes served with kajmak . Bosnian coffee, with some Bajadera. 1997 "Cindy Sherman: The Complete Untitled Film Stills, " MoMA, Нью-Йорк. 1996 "Metamorphosis: Cindy Sherman Photographs, " Кливлендский худ. музей, Кливленд. Шерман посвящён игровой короткометражный фильм французского кинорежиссёра Бертрана Бонелло Cindy: The doll is mine (2005), в роли художницы и её двойника снялась Азия Ардженто. [a]2004 US Open counts as 3 wins, 0 losses. Roger Federer walkover in round 4, after Pavel withdrew because of a back injury,  does not count as a Pavel loss (nor a Federer win). Countries|Netherlandish]] provinces that made up the new state had traditionally been less important artistic centres than cities in Flanders in the south. The upheavals and large-scale transfers of population of the war, and the sharp break with the old monarchist and Catholic cultural traditions, meant that Dutch art had to reinvent itself. The painting of religious subjects declined sharply, but a large new market for all kinds of secular subjects grew up. 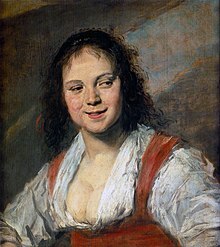 Frans Hals' tronie, with the later title Gypsy Girl. 1628–30. Oil on wood, 58 × 52 cm (23 × 20 in). The tronie includes elements of portraiture, genre painting, and sometimes history painting. The Dutch concentrated heavily on the "lower" categories, but by no means rejected the concept of the hierarchy. Most paintings were relatively small – the only common type of really large paintings were group portraits. Painting directly onto walls hardly existed; when a wall-space in a public building needed decorating, fitted framed canvas was normally used. For the extra precision possible on a hard surface, many painters continued to use wooden panels, some time after the rest of Western Europe had abandoned them; some used copper plates, usually recycling plates from printmaking. In turn, the number of surviving Golden Age paintings was reduced by them being overpainted with new works by artists throughout the 18th and 19th century – poor ones were usually cheaper than a new canvas, stretcher and frame. Foreigners remarked on the enormous quantities of art produced and the large fairs where many paintings were sold – it has been roughly estimated that over 1.3 million Dutch pictures were painted in the 20 years after 1640 alone. The volume of production meant that prices were fairly low, except for the best known artists; as in most subsequent periods, there was a steep price gradient for more fashionable artists. Those without a strong contemporary reputation, or who had fallen out of fashion, including many now considered among the greatest of the period, such as Vermeer, Frans Hals and Rembrandt in his last years, had considerable problems earning a living, and died poor; many artists had other jobs, or abandoned art entirely. In particular the French invasion of 1672 (the Rampjaar, or "year of disaster"), brought a severe depression to the art market, which never quite returned to earlier heights. The distribution of pictures was very wide: "yea many tymes, blacksmithes, cobblers etts., will have some picture or other by their Forge and in their stalle. Such is the generall Notion, enclination and delight that these Countrie Native have to Painting" reported an English traveller in 1640. There were for virtually the first time many professional art dealers, several also significant artists, like Vermeer and his father, Jan van Goyen and Willem Kalf. Rembrandt's dealer Hendrick van Uylenburgh and his son Gerrit were among the most important. Landscapes were the easiest uncommissioned works to sell, and their painters were the "common footmen in the Army of Art" according to Samuel van Hoogstraten. Frans Hals, Willem Heythuijsen (1634), 47 × 37 cm (19 × 15 in). The other great portraitist of the period is Frans Hals, whose famously lively brushwork and ability to show sitters looking relaxed and cheerful adds excitement to even the most unpromising subjects. The extremely "nonchalant pose" of his portrait of Willem Heythuijsen is exceptional: "no other portrait from this period is so informal". The sitter was a wealthy textile merchant who had already commissioned Hals' only individual life-sized full-length portrait ten years before. In this much smaller work for a private chamber he wears riding clothes. Jan de Bray encouraged his sitters to pose costumed as figures from classical history, but many of his works are of his own family. Thomas de Keyser, Bartholomeus van der Helst, Ferdinand Bol and others, including many mentioned below as history or genre painters, did their best to enliven more conventional works. Portraiture, less affected by fashion than other types of painting, remained the safe fallback for Dutch artists. From what little we know of the studio procedures of artists, it seems that, as elsewhere in Europe, the face was probably drawn and perhaps painted at an initial sitting or two. 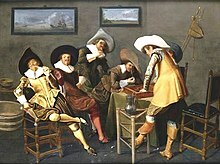 The typical number of further sittings is unclear - between zero (for a Rembrandt full-length) and 50 appear documented. 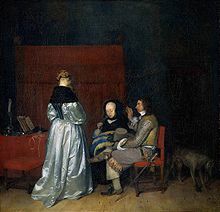 The clothes were left at the studio and might well be painted by assistants, or a brought-in specialist master, although, or because, they were regarded as a very important part of the painting. Married and never-married women can be distinguished by their dress, highlighting how few single women were painted, except in family groups. As elsewhere, the accuracy of the clothes shown is variable - striped and patterned clothes were worn, but artists rarely show them, understandably avoiding the extra work. Lace and ruff collars were unavoidable, and presented a formidable challenge to painters intent on realism. Rembrandt evolved a more effective way of painting patterned lace, laying in broad white stokes, and then painting lightly in black to show the pattern. Another way of doing this was to paint in white over a black layer, and scratch off the white with the end of the brush to show the pattern. Genre paintings show scenes that prominently feature figures to whom no specific identity can be attached – they are not portraits or intended as historical figures. Together with landscape painting, the development and enormous popularity of genre painting is the most distinctive feature of Dutch painting in this period, although in this case they were also very popular in Flemish painting. Many are single figures, like the Vermeer's The Milkmaid; others may show large groups at some social occasion, or crowds. There were a large number of sub-types within the genre: single figures, peasant families, tavern scenes, "merry company" parties, women at work about the house, scenes of village or town festivities (though these were still more common in Flemish painting), market scenes, barracks scenes, scenes with horses or farm animals, in snow, by moonlight, and many more. 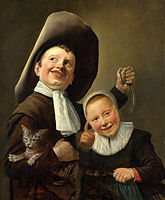 In fact most of these had specific terms in Dutch, but there was no overall Dutch term equivalent to "genre painting" – until the late 18th century the English often called them "drolleries". Some artists worked mostly within one of these sub-types, especially after about 1625. Over the course of the century, genre paintings tended to reduce in size. A stay in Haarlem by the Flemish master of peasant tavern scenes Adriaen Brouwer, from 1625 or 1626, gave Adriaen van Ostade his lifelong subject, though he often took a more sentimental approach. Before Brouwer, peasants had normally been depicted outdoors; he usually shows them in a plain and dim interior, though van Ostade's sometimes occupy ostentatiously decrepit farmhouses of enormous size. Landscape painting was a major genre in the 17th century. Flemish landscapes (particularly from Antwerp) of the 16th century first served as an example. These had been not particularly realistic, having been painted mostly in the studio, partly from imagination, and often still using the semi-aerial view from above typical of earlier Netherlandish landscape painting in the "world landscape" tradition of Joachim Patinir, Herri met de Bles and the early Pieter Bruegel the Elder. A more realistic Dutch landscape style developed, seen from ground level, often based on drawings made outdoors, with lower horizons which made it possible to emphasize the often impressive cloud formations that were (and are) so typical in the climate of the region, and which cast a particular light. Favourite subjects were the dunes along the western sea coast, rivers with their broad adjoining meadows where cattle grazed, often with the silhouette of a city in the distance. Winter landscapes with frozen canals and creeks also abounded. The sea was a favourite topic as well since the Low Countries depended on it for trade, battled with it for new land, and battled on it with competing nations. From the 1650s the "classical phase" began, retaining the atmospheric quality, but with more expressive compositions and stronger contrasts of light and colour. Compositions are often anchored by a single "heroic tree", windmill or tower, or ship in marine works. The leading artist was Jacob van Ruisdael (1628–1682), who produced a great quantity and variety of work, using every typical Dutch subject except the Italianate landscape (below); instead he produced "Nordic" landscapes of dark and dramatic mountain pine forests with rushing torrents and waterfalls. His pupil was Meindert Hobbema (1638–1709), best known for his atypical Avenue at Middelharnis (1689, London), a departure from his usual scenes of watermills and roads through woods. Two other artists with more personal styles, whose best work included larger pictures (up to a metre or more across), were Aelbert Cuyp (1620–1691) and Philips Koninck (1619–1688). Cuyp took golden Italian light and used it in evening scenes with a group of figures in the foreground and behind them a river and wide landscape. Koninck's best works are panoramic views, as from a hill, over wide flat farmlands, with a huge sky. Landscapes with animals in the foreground were a distinct sub-type, and were painted by Cuyp, Paulus Potter (1625–1654), Albert Jansz. Klomp (1625-1688), Adriaen van de Velde (1636–1672) and Karel Dujardin (1626–1678, farm animals), with Philips Wouwerman painting horses and riders in various settings. The cow was a symbol of prosperity to the Dutch, hitherto overlooked in art, and apart from the horse by far the most commonly shown animal; goats were used to indicate Italy. Potter's The Young Bull is an enormous and famous portrait which Napoleon took to Paris (it later returned) though livestock analysts have noted from the depiction of the various parts of the anatomy that it appears to be a composite of studies of six different animals of widely different ages. The Great Market in Haarlem, 1696, by Gerrit Berckheyde. Abraham van Beijeren (c. 1660); "ostentatious" still life. In all these painters, colours are often very muted, with browns dominating, especially in the middle of the century. This is less true of the works of Jan Davidsz de Heem (1606–1684), an important figure who spent much of his career based over the border in Antwerp. Here his displays began to sprawl sideways to form wide oblong pictures, unusual in the north, although Heda sometimes painted taller vertical compositions. Still life painters were especially prone to form dynasties, it seems: there were many de Heems and Bosschaerts, Heda's son continued in his father's style, and Claesz was the father of Nicholaes Berchem. For Dutch artists, Karel van Mander's Schilderboeck was meant not only as a list of biographies, but also a source of advice for young artists. It quickly became a classic standard work for generations of young Dutch and Flemish artists in the 17th century. The book advised artists to travel and see the sights of Florence and Rome, and after 1604 many did so. However, it is noticeable that the most important Dutch artists in all fields, figures such as Rembrandt, Vermeer, Hals, Steen, Jacob van Ruisdael, and others, did not make the voyage. The Bamboccianti were a colony of Dutch artists who introduced the genre scene to Italy. Jan Weenix and Melchior d'Hondecoeter specialized in game and birds, dead or alive, and were in demand for country house and shooting-lodge overdoors across Northern Europe. 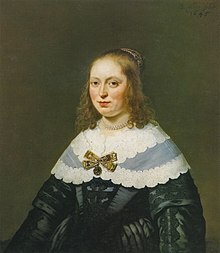 Although the Dutch control of the northeast sugar-producing region of Dutch Brazil turned out to be brief (1630-54), Governor Johan Maurits van Nassau-Siegen invited Dutch artists to paint scenes which are valuable in showing the seventeenth-century landscape and peoples of the region. 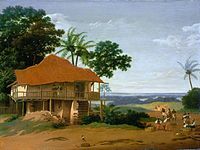 The two most well known of these artists were Frans Post, a landscapist, and a still life painter, Albert Eckhout, who produced ethnographic paintings of Brazil's population. These were originally displayed in the Great Hall of the Vrijburg Palace in Recife. There was a market in Amsterdam for such paintings, and Post continued to produce Brazilian scenes for years after his return to the Netherlands. The Dutch East Indies were covered much less well artistically. ↑ Confusingly, one particular genre of painting is called genre painting, the painting of some kind of everyday scenes with unidentified people. But, for example, still-life is also a genre in painting. ↑ Jan Steen was an innkeeper, Aelbert Cuyp was one of many whose wealthy wives persuaded them to give up painting, although Karel Dujardin seems to have run away from his to continue his work. Conversely Jan van de Cappelle came from a very wealthy family, and Joachim Wtewael was a self-made flax tycoon. See their biographies in MacLaren. The fish artist Jacob Gillig also worked as a warder in the Utrecht prison, conveniently close to the fish market. Bankrupts included: Rembrandt, Frans Hals, Jan de Bray, and many others. ↑ Fuchs, 43; Franits, 2 calls this "oft-quoted" remark "undoubtedly exaggerated". ↑ Franits, 65. Catholic 17th-century Dutch artists included Abraham Bloemaert and Gerard van Honthorst from Utrecht, and Jan Steen, Paulus Bor, Jacob van Velsen, plus Vermeer who probably converted at his marriage. Jacob Jordaens was among Flemish Protestant artists. ↑ On Diderot's Art Criticism. Mira Friedman, p. 36 Archived July 21, 2011, at the Wayback Machine. ↑ Explored at length by Schama in his Chapter 6. See also the analysis of The Milkmaid (Vermeer), claimed by different art historians for each tradition. ↑ Franits, 34-43. Presumably these are intended to imply houses abandoned by Catholic gentry who had fled south in the Eighty Years' War. His self-portrait shows him, equally implausibly, working in just such a setting. ↑ Rüdger Joppien. "The Dutch Vision of Brazil: Johan Maurits and His Artists," in Johan Maurits van Nassau-Siegen, 1604-1679: A Humanist Prince in Europe and Brazil, ed. Ernst van den Boogaart, et al. 297-376. The Hague: Johan Maurits van Nassau Stichting, 1979. ↑ Michiel van Groesen, Amsterdam's Atlantic: Print Culture and the Making of Dutch Brazil. Philadelphia: University of Pennsylvania Press 2017, pp. 150-51.
мини|слева|200пкс|Матрица для офорта «Мадонна с младенцем и котом», медь, произведение Рембрандта и отпечаток офорта на бумаге. Музей Виктории и Альберта, Лондон. мини|200пкс|Питер Брейгель старший. Катастрофа алхимика. мини|200пкс|Рембрандт (подражание Сегерсу). Отдых на пути в Египет. The word dictator now refers to what was called rather tyrant 3 in antiquity or despot in the Ancien Régime . This meaning, which developed during the French Revolution 4, is mainly used for the contemporary period . Aristotle , in his typology of regimes, makes tyranny a corrupt form of government by one, the monarchy . Montesquieu , in his book De l'esprit des lois , proposes a typology based on the governed: despotism is then a government that does not respect the liberties of individuals and whose principle is fear. Beyond their opposing ideologies, Adolf Hitler and Joseph Stalin are two strong symbols of dictatorship and represent the archetype of the charismatic leader of some dictatorial regimes. In the field of politics , we call a "dictatorship" a regime in which a person ( dictator ), or a group of people, who has absolute power, maintains it authoritatively and exercises it arbitrarily. The absolute character of power is characterized in particular by the absence of separation of powers ( executive , legislative , judicial ). This confusion of powers may be to the benefit of the executive (the most common case) or to the benefit of the legislature ( assembly regime ). It also results from the lack of democratic control and free elections ( political repression of the opponents, the non-respect of the freedom of the press ). The arbitrary power of power is reflected in the non - respect of the rule of law (violation of the Constitution , establishment of exceptions laws ). If many dictators come to power following a coup d'état (in Africa and South America in particular) or a civil war ( Francisco Franco ), it happens that a leader comes to power legally before to become a dictator (this was the case of Adolf Hitler or Kim Il-sung ) or to be a one- party regime (this was the case of Lenin and Stalin ). Nevertheless, today there are still authoritarian or dictatorial regimes, most of them on the African and Asian continents. In Europe, Belarus and Azerbaijan are considered dictatorships. Between Europe and Asia, Turkey is seen as a regime where democracy is deteriorating, at the limit an authoritarian regime. ряду относящееся, сочинение Овидия, от которого до нас дошёл лишь отрывок в 100 стихов и которое носит в изданиях заглавие «Medicamina faciei». На это сочинение, как на готовое, указывает женщинам Овидий в III книге «Науки любви» (ст. 205), называя его «Medicamina formae» («Средства для красоты») и прибавляя, что оно, хотя и не велико по объёму, но велико по старанию, с каким написано (parvus, sed cura grande, libellus, opus). В дошедшем отрывке рассматриваются средства, относящиеся к уходу за лицом. Вскоре после «Науки любви» Овидий издал «Лекарство от любви» («Remedia amoris») — поэму в одной книге, где он, не отказываясь и на будущее время от своей службы Амуру, хочет облегчить положение тех, кому любовь в тягость и которые желали бы от неё избавиться. В направлении, которого Овидий до сих пор держался, дальше ему идти было некуда, и он стал искать другие сюжеты. Мы видим его вскоре за разработкой мифологических и религиозных преданий, результатом которой были два его капитальных сочинения: «Метаморфозы» и «Фасты». Պոետ Զոռնետի սոնետը հռչակում է. «Ով չի գնում ռիսկի, Նա չի խմում վիսկի»:(Ես իմ կողմից կավելացնեի. «Տո, ի՛նչ վիսկի. գինի էլ չի խմունմ իսկի»): Մեկ այլ սոնետ եզրրահանգում է. «Жизнь без секса, Как гарнир без бифштекса». Տեռում էր, ճառում էն վերնահարկում. Ժամ առաջ քսում է վազելին. Ну, разве это большой грех?